Anne & I just finished watching "The Incredible Journey of Mary Bryant". It was originally made as a TV mini-series, so it has a fair amount lingering shots and over dramatization, but not a bad movie all in all. Based on a true story, or "Real Events" as they call it. Mary Bryant escapes from starvation at the Botany Bay prison colony in the late 1700's. Reminds me how England got to be a world power: they were more ruthless than anyone else. We like to remind ourselves of all the good things England gave us, but we tend to gloss over the dark side. I think it because our culture tells us what the rules are, and what the consequences are, and we accept it. Watched "Pan's Labyrinth" a week or so ago. Grim little tale of fascists in Spain and one little girls adventures in wonderland. Really makes you hate the bad guys. This one I enjoyed. Watched Mel Gibson's "Apocalypto" earlier this week. It was a pretty good movie, but it didn't have anything special. It seemed just like another "Lethal Weapon". Good guy escapes from bad guys. Endless chase where the pursuers fall by the wayside, one by one, all so the good guy can rescue his wife and child, and it naturally happens at the last minute. It depicts Mayan culture as plenty bloodthirsty, but somehow it just does not ring true. The good guys in the movie seem to have the same motivations as modern Americans. It had about as much in common with real life in the Amazon before the white man as a Hollywood Western made in the 1950's had in common with the real wild west. But just like a Hollywood Western, it made a good tale. We drove up to Seattle this weekend, ostensibly so Kathryn could tour the University of Washington (U-dub) Campus. She has mentioned that she might like to go there after she graduates from High School. I do not see how we can afford it, well, actually I do, but I do not like what I see. It would cost roughly twice what it would cost to go to an Oregon state school. I am sorry, but I cannot tell the difference between degrees from different schools. Anyway we stopped at the University of Puget Sound in Tacoma and walked around their campus for a while. Very nice place, lots of green grass, trees and stately brick buildings. Then we drove on up to U-dub and walked around their campus. Much larger place, lots of trees and grass and a whole bunch of very impressive buildings. Denny Hall looks like it could be part of Hogwarts School of Witchcraft and Wizardry (of Harry Potter fame), at least on the outside. The inside has been done over in fascist modern, no sign of the original interior at all. This picture does not really do it justice, but it is the best one I could find on the net. Now we go downtown to our hotel and we run into our first and only traffic jam. We inch along westbound on 45th until we get to I-5 and I think, finally we will get clear of this mess, and then I look down and I see that I-5 southbound is a parking lot. Well, not quite, they are moving, but not very fast, and it does not look like much fun. I barely manage to escape the entrance ramp and we wander around through various residential and business neighborhoods until we find our way across the Fremont Bridge, up Dexter Avenue and so into downtown. We have booked a room at the Westin, which my wife and daughter found very much to their liking when they here a couple of years ago for a dance team competition. They gave us a room on the top floor of the taller of the two towers. Pretty cool being on the top floor. Not sure why that is. Never been on the top floor before. Room was just a regular, although very nice, hotel room. No gold plated statues or anything like that. It is still early, but we decide to go ahead and have dinner. We got a late start this morning. Our original plan called for us to leave by quarter after eight, but it was more like eleven before we were actually rolling. We all missed lunch, except Johnny who got a quarter pounder with cheese at the McDonald's in Woodland. We wander down to P.F.Chang's (Chinese Franchise restaurant). We order three dinners and split them family style. It turns out to be just about the right amount of food. The place is nice enough. P.F. himself makes an appearance later on, at least I assume it was him, or maybe all the managers at all the restaurants in the chain have the same uniform: older Chinese, not very big, with glasses, formal trousers and suspenders. The girls take off to go shopping. Johnny and I head over to "Cold Stone Creamery" for some ice cream. Johnny gets white chocolate, I pass. We wander around for a while looking for a theater. I think we circle the same block three or four times before we get our bearings. The old Bon Marche is still there, and so is the adjacent parking garage. These were here when I lived here 45 years ago. The Bon Marche is now Macy's, but the Bon Marche logo is still on the side of the building, though it is only one tenth the size of the Macy's name. We finally locate a theatre at the corner of 7th and Pike, across the street from the Washington State Convention & Trade Center. This place is impressive. The pictures do not really do it justice. It is big! We can see it easily from our hotel room. The theater is a Regal Cinema, with the high prices that entails. I ask for one adult and one student ticket. The ticket vendor does not want to sell me a student ticket. Johnny is not with me, he has wandered off somewhere. Vendor wants to see an actual student ID. Well, never mind, just give me two adult tickets. A student ticket is not going to be that much cheaper anyway. Now the stooge relents and sells me the student ticket. It still comes to almost $20. Turns out it saved me a buck. Big whoop. Another black mark for Regal, the money grubbing, soulless corporate purveyors of sanitized-for-your-protection entertainment. We have 40 minutes to kill. There is a guy out on the sidewalk with a bunch of empty five gallon buckets. I think he is trying to entertain people, but he is doing a very haphazard job of it. He stacks the buckets up and climbs on top and stands there. He wanders around. Later, we here him drumming away on them. Maybe he was just warming up for the evening show. The movie was "Hot Fuzz", a comedy from the same people who brought you "Shaun of the Dead". The lead actor was the same in both movies, and halfway back to Portland, I realized that the sidekick was also the same in both movies. It was entertaining, a perfect end to a day spent tramping around college campuses. I may have to take my wife to see it. By the time we get back to the hotel about three blocks away, the girls are already there. The hotel must be mostly empty because so far all our trips in the elevator have been non-stop. The girls had a good time shopping. Kathryn bought a half dozen items including a dress. They claim the Nordstrom's here has a bigger selection than the one in Portland. They were thrilled. I am glad I did not have to go. Time to turn in. Uh-oh, forgot my CPAP machine. This does not bode well. Oh, well, we'll just have to make the best of it. I have a hard time getting to sleep, but once I do, I'm fine. Everyone else has a miserable night because of my snoring. This makes me wonder if I really sleep as well as I think I do when I sleep in the recliner. A few months ago my CPAP machine started acting up, so I started sleeping in the recliner in my office. It is far enough from the rest of the family so I do not disturb them, and as far as I am concerned, the recliner is just as comfortable as a bed. So I have been operating under the illusion that my sleep apnea is not bothering me and I am not snoring because I am sleeping on an incline. When I first got my CPAP machine, it was like a miracle. I got up in the morning feeling rested for the first time in my life. I felt like a new man. But perhaps one night without the CPAP, or perhaps even a few months without it, are not enough to duplicate the conditions I had developed over a period of years. And I do not know if I snore when I sleep in the recliner. All I really know is that no one ever complains about it. The bathroom was a standard hotel bathroom, but there were a few items in there improved it a bit. The shower curtain rod was bowed out at least a foot. I thought this was a bit silly, but when I got in the shower, it made a world of difference. You could turn around without constantly running into the shower curtain. The little loops that held the shower curtain to the rod had several little metal balls that acted like rollers. The difference it makes in letting the shower curtain move along the rod is impreceptable, but then I had nothing handy to compare it to. Perhaps it does make a difference. There were two shower heads on a U-shaped pipe that connected where a normal shower head would go. They were both adjustable. Maybe this is how they get around the restricted flow requirements. The lower shower head had two studs sticking out, one on either side. One was brass, one was chrome. The only thing I could they could be for was for hanging clothes hangers, if you wanted to steam your clothes or something. Very odd. The soap dish was a trick. It was made of thick metal wires (thin metal rods?) and mounted in the corner. Very handy, until you try to pick up the soap. Then the soap slips out of your hand and slides between the wires and falls to the tub. After having this happen three or four times, I finally figured out that you needed two hands: one to tilt the bar and the other to catch it as it fell between the wires. The toilet was a fine machine. One press of the button and it flushes completely. None of this having to hold the lever down to get it to flush, or having to jiggle the lever to get it to stop running. Brand name of Toto, I might have to get one for the house. When the kids finally get up I take them to breakfast at the coffee bar in the lobby. Kathryn gets a bowl of fruit and a slice of banana walnut bread. Johnny gets three single serving boxes of Honey Nut Cheerios. Tons of fresh baked goods, a complete grill, and he has Cheerios. Oh, well. And a cookie. Kathryn only eats half of her breakfast and Johnny can't finish his cookie, so once again Dad gets a meal with having to order anything. Oh, I did order a cup of decaf black tea. They made it for me on the spot. Did not have any decaf tea bags, at least not black tea, so they use a regular one. Let it steep for 60 seconds, which dissolves the caffeine, throw out the water, and refill it with more hot water. I had already had one cup of coffee with Anne, and I did not want to go overboard, so I thought this was prudent. Especially since I am going to be with a bunch of sleep deprived people all day. Saturday when I was trying to park I had a devil of a time. First I spy this one entrance, but it turns out it is a drive up entrance to the hotel, next I find the parking garage, but it is closed. Then I find "Westin Parking", but it is not on the right street. I eventually pull in there, but the sign says it is NOT affiliated with the hotel, there is somebody chatting up the attendent, people are blowing their horns at me because I am blocking traffic because I don't want to block the sidewalk. I finally have had enough and back out go back to the first place I tried. And for every one of these attempts, I have to drive around the block and sit through four left turn traffic lights so it takes like forever. Anyway, like I said, self-serve parking is closed. They offer to park it for me at the self-serve rate, whatever that is, but when my bill showed up at two in the morning there is a $30 charge for parking. We pack up and go to pick up the car from valet parking. The woman at the valet desk offers to reduce it to the self-serve rate and punches some keys on the computer. I note that this saving may pay for the can of nuts from the mini-bar that Johnny ate last night because he couldn't sleep because he was hungry. I leave a $5 tip for the valet. We head down to the Pike Street Market. Even though Kathryn and Anne spent yesterday evening together, they have completely different ideas about where we are going this morning. This leads to some histrionics. Lack of sleep is probably a contributing factor. We end up parking in six story garage in back of the market. You enter from the roof and drive down until you find an empty spot. The ground floor exits to the waterfront. We find a book store, a movie store, a store selling pen and ink drawings of Seattle area buildings, the fish and flower markets, and a toy store. In the book store I spy a copy of "I Chong" by Tommy Chong. I ask my kids if they have ever heard of the "I Ching". No. How about "Cheech and Chong"? No. How can this be?? My kids education is severely lacking, I have failed as a father. I resolve to correct this deficit and buy a copy of the "I Ching". I bought a print from the drawings store. It is a view of downtown from across Elliot bay. Smith Tower is visible as a small building on the edge of downtown. When I lived here 45 years ago, it was the tallest building in Seattle. The toy store had a very fancy marble race track made of wood, reminiscent of the contraptions featured in the movie "Fracture". It was, however, unreliable. Marbles would sometimes jump the tracks, and we just cannot tolerate that kind of behavior. Besides, it was expensive. I did find one cool toy. A ball that turns itself inside out when you toss it. It is made of a bunch of pieces, like a geodesic dome. Not like a balloon. Speaking of not balloons, there was an art shop in the lobby of the hotel. The had a bunch of very fancy glass pieces. They had some balloons made of glass. At first glance I thought they were real balloons, but then I think I noticed that they were not moving and realized they were glass. They also had some impressive looking ray guns made of glass and some artificial gemstones made from volcanic ash from Mount Saint Helens. Our last stop at the Pike Street Market is at the corner newsstand. Kathryn spots a nut shop so we investigate. A woman has a counter opening onto the sidewalk with about dozen different kinds of roasted and/or sugar coated nuts for sale. She has a baby on one shoulder and a cell phone on the other. One hand is holding the baby, the other is using a scoop to replenish the free samples lying on top of the counter. When someone has an order, she fills a sack sitting on the scale in front of her and collects a five dollar bill. She was doing that when we got there and she was doing that when we left. Johnny found got a copy of CPU magazine, Anne bought a newspaper. On the way home Anne spotted a low flying plane. 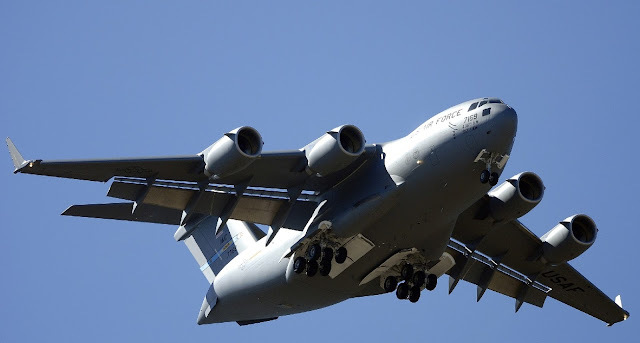 It was a C-17 (a large military cargo plane) coming in for a landing at McChord field. We stop in Centralia for gas, lunch and, of course, shopping at the outlet mall. I drop the girls off and go for gas. I am in no hurry, it will take them forever, so I cruise through downtown Centralia. They have an old train station that seems to be in very good repair. I fill up at the Arco station, it takes me a minute to realize this is a self serve station, and they do not take credit cards. They do take debit cards, though it costs 45 cents. I spend $65 on premium. Back to pick up the girls and go to lunch. They do not say what they want, they say this would be nice, or that would be nice. But I have just endured a tirade from Johnny about how only pizza will do, so I drive to the pizza joint. Well, Kathryn is NOT going to have pizza, and I am not going to drive each person to a separate joint for lunch. We are all going to one place for lunch. What is it going to be? Mom decides on Shari's so Shari's it is. Turns out that although they have an extensive menu, they do not have pizza. Johnny is flexible, he finds something else that captures his fancy. I order a side of fruit and a coffee. Anne shares her cheeseburger with me. Kathryn, as usual, cannot finish her meal, and allows me the scraps, that is until I am half way finished, and then she claims she wants some more. So I give her plate back, but she does not eat the rest of the food. She was lying! It was just a ploy to get the plate away from me and deprive me of half a slice of cinnamon french toast (with butter and syrup)! Ungrateful wretch! She will pay for this piece of treachery! The girls have one more stop: the Nike store. I see a Western wear store and go look around for a bit. Cowboy boots have changed a bit, but not as much as I expected. You can still get a decent pair of boots for under $200. There are more imposters now, boots made in China and India, and boots made with molded rubber soles. I did not see any boots with pegs in the sole, which is part of the traditional way of making boots. The girls are dawdling in Nike, I go back to the car and get out a book to read for a while. Update: November 2012. Added the picture of the C-17 when I realized the link was I had used was dead. That's why you should always make a copy of any picture you want to steal off of the net. Links go dead without any warning. Anne & I are half way through the PBS mini-series "Bleak House", by Charles Dickens. I cannot imagine a large English house going by the name of "Bleak", but the English do a lot of funny things. Last night we watched ".45" with Milla Jovovich. The characters are rude, crude and vulgar, just the kind of people you don't want to hang around with, and not really very interesting characters. But then it gets interesting. Milla's boyfriend beats her and terrifies her and she sticks with him. She loves him. The part of the beating that she is most upset about is that he cut her hair. She does a great job of dramatizing her situation, best I have ever seen. But then she comes up with a sly psychological ploy to get rid of him. Don't know whether it is really in keeping with her character, but it allows her to get her revenge, which is what we (the audience) wanted. I finished reading Neal Stephenson's "Quicksilver" this afternoon. What a book! I think it took me the better part of a month to read it. Dense, complex, long winded in places, a whole nother world, but still, not that much different from our own.